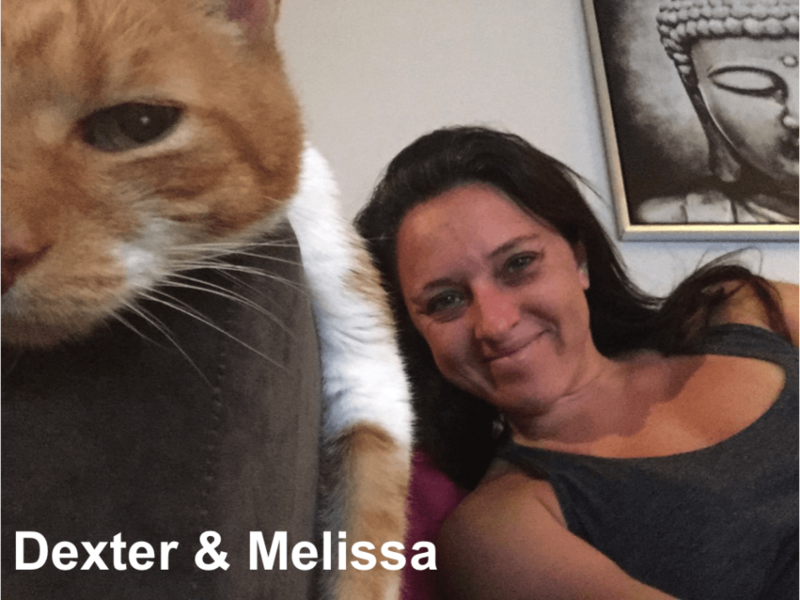 Melissa recently contacted Gail for a consultation regarding her treasured cat Dexter. About a year and a half ago, he was diagnosed with a cancerous nasal tumor near his right eye. The journey that Dexter and Melissa shared was challenging, and they found Gail’s ongoing animal hospice support extremely helpful. To honor Dexter and to show their gratitude for BrightHaven, Melissa is raising funds to help support our work! The sanctuary that is BrightHaven needs your help to bring comfort to more dying animals. 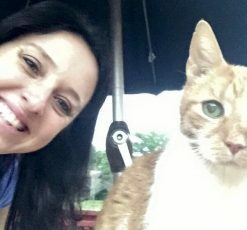 The unique support they provide has the potential to demystify the death of a pet by celebrating their life. Your donation will no doubt make a difference in the lives of many. Dexter and I were introduced to BrightHaven (www.brighthaven.org) a year and a half into our journey of learning about cancer, natural healing, and the incredibly intricate world of life and death. BrightHaven is an animal sanctuary and educational facility that focuses on helping others navigate what may be a terminal diagnosis in a pet’s life. Dexter and I are examples of how the work of BrightHaven has the potential to help transform grief into a sacred experience. As much as we struggled over the course of Dexter’s illness, it wasn’t until we were introduced to Gail at BrightHaven that we were able to access the skills we needed to peacefully move through his transition towards death. 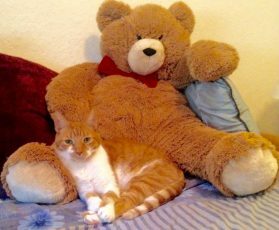 In the last few weeks of Dexter’s life, Gail made herself available to consult with us at the times we were in most need of support. She was able to normalize our experiences, remind us to be present in his final days, and help us get the right medical attention from some of the best doctors for Dexter. Without this support, I might have missed out on the many ways I was able to honor Dexter all the way to the end. 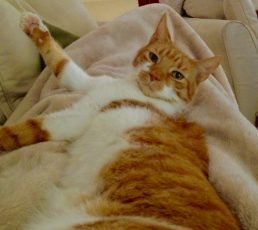 Although Dexter took his last breaths ending his battle with cancer, my own journey to help others demystify the death of a loved pet has only just begun. One of the many things that became eminently clear to me during Dexter’s dying process is how fearful people can be about death, including myself. This is understandable considering how people are often gripped by the fear of death in all its many forms. It can be a very confusing time for some people when their pet is diagnosed with a terminal illness, and getting the right support can make such a difference. As much as it is difficult for some people to imagine, most of us will out live our pets. In other words, it is not IF we are faced with the death of our pet, but how we are prepared to deal with it WHEN it happens. The intention of this campaign is to better equip people to help their cherished animal friends in their time of need, whether that means living a longer healthier life, or transitioning through the stages of death. Below is a brief introduction to Gail and some of the beautiful BrightHaven animals. 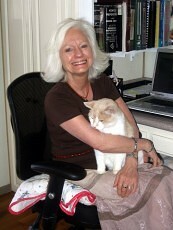 Gail Pope, the founder of BrightHaven, has been able to take all she has learned in her nearly 30 years of working with elderly and disabled animals, and make it accessible to animal lovers around the world. The problem is, with the many expenses of the sanctuary, BrightHaven has not had the funds it needs to provide services to the many animals desiring to complete the circle of life in peace with their people. This work is incredibly important considering the vast number of animal lovers who find themselves in similar situations as Dexter and me, but without the support, tools, or perspective they need to navigate palliative care, and the challenges that can arise at the end of a pet’s life. In memory of Dexter, we wish to raise both money and awareness to do our part in demystifying the death of a pet. Our intention is to raise $6,500, $500 for every year of Dexter’s beautiful life. The money raised through this campaign will help more people get the invaluable support Gail was able to provide to Dexter and me. Your contributions will also expand the pro bono work Gail provides to people who are overwhelmed with vet bills, and will help her to create necessary educational materials. Most importantly, your donations will give BrightHaven the money they need to continue serving the many beings they are meant to serve. Dexter and I are forever grateful for your support. As a token of our appreciation we want to offer anyone who donates to this campaign a copy of The BrightHaven Guide to Animal Hospice. This book is filled with many tools and beautiful stories of animals that have successfully moved through the golden years of their lives. Her words of wisdom not only give you an opportunity to grow as a person, but they can help you give back to your pet who might be faced with death, the way your pet gave to you in your life. The BrightHaven family extends our heartfelt thanks to Dexter and Melissa for their generosity!